Sweet & Savory 2018 - A Success! The Midlands’ top culinary masters and Columbia’s best foodies gathered on April 26 for Palmetto Place’s annual Sweet & Savory Chefs Competition and raised over $26,000. The competition featured 10 chefs from across the state who brought their best dishes to the table. From savory southern dishes like Lamb Lollipops, to sweet treats like Chocolate Avocado Truffles, chefs and attendees enjoyed the growing food scene in Columbia while supporting abused and neglected youth and teens. This year’s competition included chefs Ben Perzan and Arie Shankar from the Mediterranean Tea Room, Brenda Perry and Yasmeen Bull from Southern Foodservice Management, Dave Grillo from Cantina 76 and Za’s Pizza, Robert Stegall-Smith from Performance Foodgroup Florence, Michael Giri from Embassy Suites, Lawrence Wright and Vinnie Livoti from BlueCross BlueShield of South Carolina, Jason Bruner from 1801 Grille, and Charlie Young. Sweet & Savory is just one of the many events throughout the year that Palmetto Place hosts to raise money and gain supporters. The organization works closely with community partners like United Way of the Midlands and BlueCross Blue Shield to promote its fundraising efforts. On International Youth Day and every day, we strive to recognize the vital importance of protecting some of the most vulnerable youth in our community from abuse, homelessness, and neglect. What if making sure every child a has a safe place to call home was as easy as spending a day at the golf course or shopping at one of your favorite stores? Our kids have loved visiting the zoo in the past. From exploring the new exhibits to zip lining across the Saluda River there is something for kids of all ages. You can help us celebrate National Zoos and Aquariums Month by donating tickets for our kids. Save the Date: Midlands Gives is May 2nd and Palmetto Place is participating! 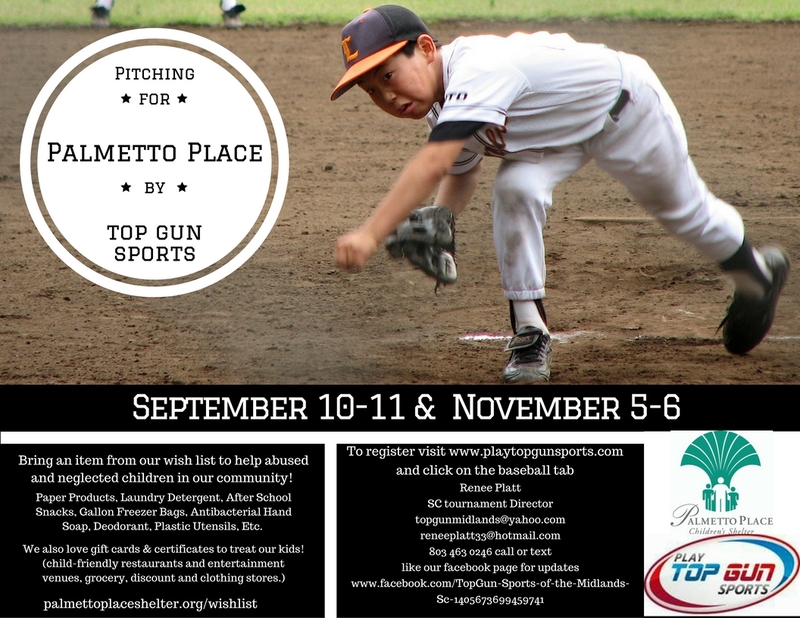 Join TopGun Sports of the Midlands for "QUADRUPLE PERK WEEKEND" baseball tournament and donation drive for Palmetto Place November 5th and 6th! For more information click here or email Renee Platt. Three (3) Free Paid Berths to the Summer Nationals Championships, Winter World Series, and Winter National Championships. No number of teams per bracket required from Top Gun for Award and Prizes. Bracket Maximum is 6 teams per Bracket, which means More Winners and More Free Paid Berths for our teams. Top Gun always gives Trophies to Champions and Runner Up Teams. Perk Prizes are always in addition to our Great Trophy Packages. This event will also be a Benefit Tournament for "Palmetto Place" to help abused and neglected children in our community. Please bring a item from our wish list, Paper Products, Laundry Detergent, After School Snacks, Gallon Freezer Bags, Antibacterial Hand Soap, Deodorant, Plastic Utensils, etc. Top Gun will donate 100 Top Gun Score Books to the first 100 Donations to the event. Top Gun "Batting Gloves" to all Winning Teams, and "Phiten Necklaces" to all Winning and Runner Up Teams. All teams entered will receive a Free Top Gun Coaches Bucket, and Three (3) Free Top Gun Coaches T-Shirts. Extra Award for all Champion and Runner Up teams all Brackets all Ages A Top Gun Commemorative Wooden Bat. $1,500.00 Free Paid Berth to the 2017 Summer Nationals and 2016 Winter Nationals and 2017 Winter World Series. Spring Zone Activation Required for Summer Nationals Free Paid Berth & Fall Zone Activation Required for Winter Berths. Batting Gloves for all Winners, and Phitens for Winners and Runner Ups. We had such a great response at the September "Battle of the Bats" donation drive. We can't wait to finish up the season the same way! If you are interested in bring an item from our wishlist you can find it here. Thank you to everyone who was a part of Sweet & Savory. Palmetto Place depends on this fundraiser to keep our doors open and allow us to serve abused, neglected and homeless children and teens. This year we were able to raise an incredible $35,000! We wouldn't have been able to do this without our sponsors, chefs, committee members and of course, donors like you. Now, the moment you've all been waiting for. The winners of our 2016 Sweet & Savory Chef Competition! From our special guest judges, the Best Sweet Dish winners are Chefs Ben Perzan and Arie Shenkar from the Mediterranean Tea Room with a Peach Mascarpone Jam and a Blackberry Mascarpone Jam on top of French Toast. The Best Savory Dish winner is Chef Robert Stegall from Performance Food Group with Cowboy Shrimp & Grits! From the guests’ ballots, the Best Sweet Dish winner is Chef Robert Stegall from Performance Food Group with Chocolate Truffles and the Best Savory Dish winners are Chefs Vinnie and Daniel Livoti with a Potato Hash Trio with Tasso Ham Gravy, Pulled Duck and Raspberry Balsamic Drizzle! Save the Date for April 28th, 2016! *Tickets can be purchased at the door. Attire is everything from business attire to cocktail dresses, suits to khakis & polos. Our annual Sweet & Savory Chef's Competition is coming up! Join us for a night of tasty treats and one-of-a-kind auction items. Let your voice be heard by voting for your favorite sweet and savory dishes. Learn more about Palmetto Place and support abused, neglected and homeless children and teens throughout the state.